It is an acronym for web server gateway interface which is a standard for python web application development. It is considered as the specification for the universal interface between the web server and web application. Jinja2 is a web template engine which combines a template with a certain data source to render the dynamic web pages. To install flask on the system, we need to have python 2.7 or higher installed on our system. However, we suggest using python 3 for the development in the flask. virtualenv is considered as the virtual python environment builder which is used to create the multiple python virtual environment side by side. It can be installed by using the following command. Once it is installed, we can create the new virtual environment into a folder as given below. To activate the corresponding environment, use the following command on the Linux operating system. On windows, use the following command. We can now install the flask by using the following command. However, we can install the flask using the above command without creating the virtual environment. 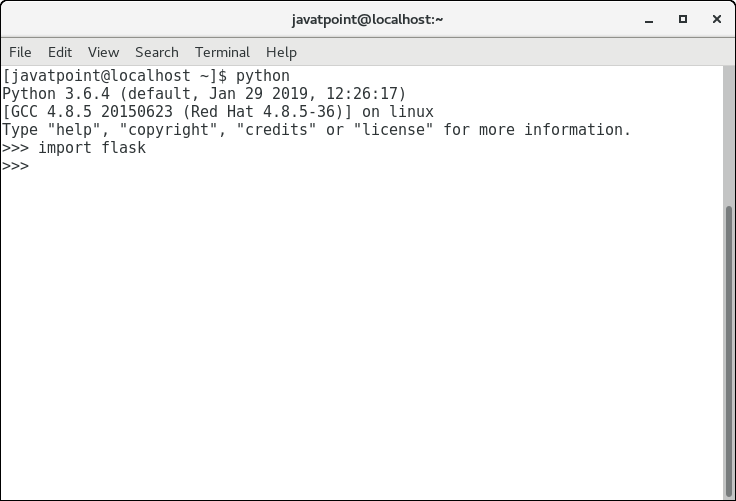 To test the flask installation, open python on the command line and type python to open the python shell. Try to import the package flask. We have successfully installed the flask since we do not get the error in the process. Now, we can continue with the tutorial.